As if I didn't already have enough reasons to be completely in love with Cardona's Market, now it has an expanding cheese selection. In the past few months, it's gone from just a little corner to a full-on cheese section. It's so delicious seeming, in fact, that it actually managed to get my head out of the olive bar -- which says a lot for an olive lover like me. I know, I know, it probably seems like I'm jumping on the bandwagon here, but honestly, can you blame me? Cardona's -- on Delaware in Albany -- has always been a local gem and it just seems to continue getting better. As you'd probably expect from an Italian market, most of the cheese tends to be of the Italian variety, like pecorino romano, ricotta salata, parmigiano-reggiano and fontina, but there are plenty of other varieties as well including several less common Italian cheeses. And yes, there are several types of mozzarella, of course. There's also a pretty good showing of local cheeses, including products from the Old Chatham Sheepherding Company, Berkshire Blue, and Nettle Meadow Farms. Like any good cheese purveyor, there are frequently free samples available. A sample of aged provolone I tried last week may have completely radicalized my previously held belief that provolone is a rather bland cheese. The aged stuff is far too pungent and tasty to even share a name with that stuff you get in deli slices. This brings me to one of my favorite parts of Cardona's cheese selection - the smell. Just take a deep breath and inhale. Seriously, it instantly cheers me up no matter how cranky I might be that day. Cheese purists will be happy to note that while there are some pre-cut, pre-packaged cheeses, most of the products come in giant blocks cut and wrapped to order so you don't have to worry as much about your dairy delicacy being smothered in unbreathable plastic. (Really. I'm told this is a problem for cheese. Apparently cheese needs to breathe.) 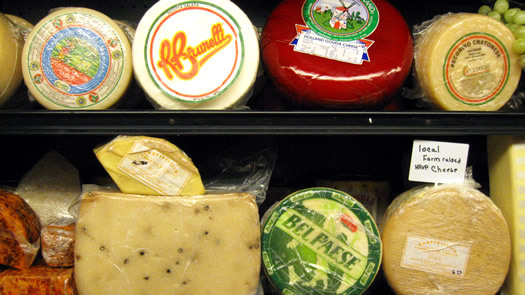 Try not to scoff too much at the few standard grocery store cheeses tucked in among the ranks -- after all, Cardona's is a diplomatic place. Of course, the main problem I have with the ever-expanding cheese selection is that it makes it even more impossible not to spend a fortune every time I stop in. I'm starting to think there must be some sort of addictive drug in the store's aroma. And the tweets about the daily lunch specials are not helping. Ohhh so glad it's almost lunch time! I love Cardona's. Today I got some biscotti and a cranberry soda for a snack and a couple of tilapia fillets and artichoke ravioli for dinner. Can't beat it. Thank god there is a cheese counter that actually smells like cheese. Seriously, I thought it was just my imagination, but last time I was at the HWFC, I took a big whiff as I was standing in front of the cheese counter... and nothing. Nothing. It smelled like air. Blindfolded, you would have no idea you were standing in front of what most people claim to be the best cheese selection in the area. I would much rather prefer a small carefully selected cheese counter where they actually take proper care of their products. And just for the record, offering tastes of cheeses is mandatory. Cheese can vary dramatically wheel to wheel. 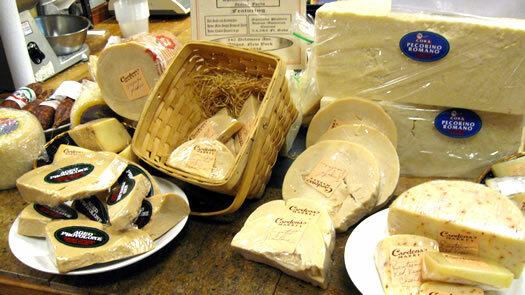 So that aged provolone you had could taste completely different next time you are there. You always need to taste before you buy, just to make sure. Thank you for the update. You rock. Those photos make me want to stop in after work today. Good stuff. I am in love with this place. We frequently buy their homemade meatballs and sauce to make with spaghetti - makes for a cheap, quick, and delicious dinner. My boyfriend was in there last night, near closing time, and they just loaded him up with extra penne a la vodka. SO DELICIOUS. I can't wait to check out the cheese selection! 2nd week in a row I bought the smoked mozzarella. YUMMY! Their vodka sauce and fresh blueberry muffins are tasty too. i went yesterday assuming i could get most of the ingredients there for an easy italian meal. no basil. no ricotta cheese. no meatloaf mix (mix of 3 meats to make meatballs and meatloaf with). their parm cheese was ridiculously priced with no lower priced alternatives (i get it - parm reg is expensive - but have something decently comparable). i then waited for 20 minutes to get rung up for bread (which was delicious) and an onion. it is wonderful that they are getting more cheeses, but i have seen other specialty stores do it better... i hope this was just an example of a bad day there...not how it is every day.